Here in the Interview Program Office, we think it is crucial for all prospective Penn students to meet with one of the university’s most enthusiastic representatives: a former Penn student. This is especially critical for our international applicants who may have never had the opportunity to speak with someone who is or has been affiliated with Penn. However, as large as the University is, we can’t always guarantee that there will be Penn Graduates in all of the areas applicants are applying from. The Question: How to reach exceptional students from unique areas of the world? Virtual Committees, new to Penn as of this year, are dedicated to offering interviews to Penn applicants from areas where there are fewer Penn alumni to meet in-person, and where we can connect these students to alumni via Skype or phone in order to help Penn achieve its goal of 100% interview coverage for all applicants. Thus far, these virtual committees have interviewed over a hundred applicants from areas without local committee representation. Because of interest from alumni looking to support their home country, our office has recently added four exciting new international virtual committees: Africa, Europe, the Middle East, and Latin America. For the first time ever, applicants from countries like Cote D’Ivoire, Japan, Mexico, Romania, Cameroon, Germany, Cyprus, Antarctica* , Barbados, Argentina, Sri Lanka, Paraguay, Finland, Oman, Croatia, are given the chance to speak with a representative of Penn. If you are reading this and are a Virtual Interviewer, 1. Thank you! And 2. Let us know how it is going for you- we’d love to hear your stories. If you are not yet an interviewer and would like to get involved or simply learn more about the program, please visit our website, or contact us directly at interviews@lists.upenn.edu. *Just kidding. 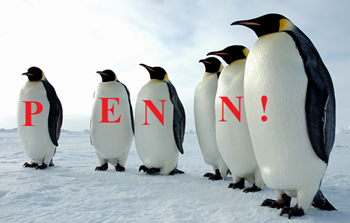 We have yet to reach any prospective Penn-guins. If you’re aware of any, let us know.